with just three weeks’ notice! It doesn’t need an apostrophe because they’re not actually possessive – the notice and time don’t belong to the three weeks. Interesting article! But I am not sure that I would always agree, despite the authority behind the article. I was taught only to use possessive apostrophes with living creatures, because only things that are alive can truly posess. A ‘week’ cannot therefore posess, and no apostrophe required. I am entirely with Rob, not Genghis here! You could alsways subscribe to the Usenet group ! Yes, but what does the Daily Mail say on the matter? Who’s to blame for all this ‘apostrophe abuse’? Don’t panic, all will be fine after Brexit. Apparently. No. When Useage superceeds rules we are on a slippery slope. People need to be focussing on getting it right! Geoff – Why are you speaking modern English if you objected so strongly to the evolution of language? They are “possessive” in the sense of “three weeks OF time”…and they totally need the apostrophe. You can see it more clearly in “one year’s time”, where “one years” would make no sense. not sure how it got to be offered free online – I paid good money for that! In my view the apostrophe is needed because it denotes a missing element; the full phrase would be “six weeks OF annual leave” or whatever. And usage is no reason to adopt something as it varies enormously from one country to another. I put the use net group in brackets, and it has been remopved from the posting – I shall try again. I wonder if these are “Opening prices” or a sign of where they will be positioned. I Notice on Vienna – Barcelona Level are cheaper than Vueling. but when i tried access the Vueling website directly, the Level flights didn’t show up ! Aren’t Palma and Majorca the same place? Yet, it directs you to the Vueling website to book… they may not mess about when it comes to getting things done, but they still manage to maintain a brand identity crisis! It obviously takes longer to set up an booking system than an Airline! it looks like the comparison websites aren’t picking up these flights yet. unless anybody has found one that is ? I would expect that the reason for using the Level brand instead of the Vueling brand has something to do with their recent strikes. Probably too much industrial action baggage which would roll over for the same brand. if the reason that they’re using the Level brand rather than Vueling is the damage inflicted on the Vueling brand whilst Cruz was in charge … makes you wonder why Cruz is being kept at BA ?! Told you Vueling was toxic Rob! ???? We all know my Vueling hate, still think it is the worst airline in Europe. 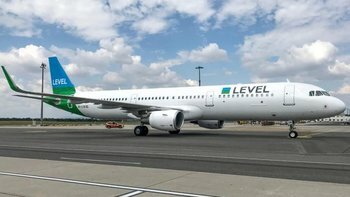 Given IAG’s record, I doubt this will make much of a difference to service especially as it’s basically Vueling behind the scenes. I suspect it will be part of a consolidation of brands, given considerable amount of money was spent on developing LEVEL as a brand using Brand Union, and it was set up from the outset as an international brand more. OT but no bits and flying-related. Has anyone else read about the imminent ban on having powdered items in hand luggage when flying to and within the US and Australia? I saw a piece in the media quite by chance; I’ve had no notification about it from BA or AA, with whom I have several flights booked this summer. Passengers will be limited to a small amount of anything in powder form, which may have quite an impact on hand-luggage only fares. Since the liquids ban came into force I travel with a fair few toiletry and food items in powder form in my carry-on, especially when I need to limit checked-in bags. Also – when you go through security in the UK, how will they know what your destination is for purposes of checking powdered items? I noticed this in April when travelling from Frankfurt on Lufthansa, not to the US or the UK but on a EU flight. I handed over my liquids separately but they insisted to see the contents of my bag where they discovered my cooling powder. I was made very clear that I should know that the scanning machine would recognize this as a liquid and that I should treat it accordingly. Never had this before. Do you earn TPs on vueling (any by extension LEVEL)? No, You earn Avios on Vueling (Not Level unless booking through IB.com) but don’t earn Tier points in Exec Club. You can get Status with Vueling but you obviously need to fly on them a lot for that. In a similar article, I read that taking food in hand baggage is not recommended as scanners find it difficult to differentiate between bread and explosives! Could this foresee a restriction on taking Boots/WHSmith meal deals on board ex LHR/LGW? Surely not! I’ve still to experience the offer of M&S inflight catering, or for that matter the Boots/WHSmith possibilities. I often take frozen joints of lamb or beef (and a whole turkey at Xmas) in my hand luggage and have never had problems, sometimes they pull me out to open the bag to see what it is, but generally not. European travel but the Security staff wouldn’t know that. They’ve never been confused by sandwiches! I bought a whole bunch of amaryllis (which have hollow stalks) for my wife on the street during a day trip to Amsterdam from London – the florist put a plastic bag at the bottom holding water. The Security Staff at AMS made no complaint – indeed they smiled broadly when I put them on the belt to go through the scanner. I was pulled over at Prague for having a 45cm long 4cm wide salami in my hand baggage. I can see that it would have looked just like a large cosh on the scanner. The lad on security opened my bag VERY carefully, and then burst into fits of giggles. Strangest look I have ever recieved was when I put through my Sky Box as hand luggage. I hadn’t even thought how it would look on the X-Ray. I was advised next time to give them a heads up before it went through but after an extra minute of checking I was on my way. My Dad came to see us on the Kent coast a while ago and took several crabs and quite a few oysters back on the Eurostar… apparently this caused great confusion at security! I had trouble at T5 recently when a bottle of Hilton’s Peter Thomas Roth mouthwash (nicked from Hilton Park Lane the previous week) got the scanners VERY worried. Never had any problems at Eurostar security. Once, returning from Aachen, at the Bruxelles Midi secuirity check I had the case I had gone out to Cologne with, plus a second overnight bag I had had to buy in Aachen, plus two umbrellas (presents) and a bag of shopping from the station supermarket. No problems at all. And I got back to London well before the rest of the group who had gone back to Koln Airport – major flight delay! I certainly wouldn’t recommend trying to take blocks of marzipan! We took a picnic on a flight recently – the scanner was most unhappy with the hardboiled eggs! 3 of us travelling: one bought Pret, and bought Boots meal deal and I did the BoB. Boots voted best for content and value . BoB. Ugh! I always get a Boots meal deal. I save my Boots points for this specific purpose. Except this year I happened to have so many that I could also buy the mother in law’s birthday present with them ???????? Yes, discovered Boots Meal Deal at NCL earlier this year. Repeated the exercise at LHR. And yes, on Advantage points seems a vastly better deal than BoB with Avios. I packed a ripe durian into my luggage, all the way from Hong Kong. My wife smelt it as we walked through Heathrow the next morning but she didn’t realise what I had done till we unpacked at home! True story! I once brought a century egg from Hong Kong to the UK to terrorise my brother with. Maybe Hong Kong wins the ‘best souvenirs’ award. struggling to compete with the great anecdotes, best I can offer is I took a blender out to our place in the sun quite a few years back, Security T3 got worried about whether I could potentially detach the blade and cut the trolley dolly’s neck or something (I think it was indeed detachable). Any points to be earned on Level? The article is silent on this aspect. I guess it’s still a grey area, and I doubt they’ve thought about it. If you ask me, LH is based on distance while SH operations are revenue based. A friend flew LBA-IBZ FR2486 on 21st June. Ryanair handed passengers form stating no compensation due to tech problems of inbound flight from Poland. Is this a reasonable denial of EU 261. Any sites I could check. Almost certainly not (depending on the exact nature of the technical problem). Technical problems are now considered part of the normal operation of an airline (hence something they should plan for) and not ‘exceptional’. difficulties with inbound flight are not relevant. The difficulty has to be a qualifying one and it has to be affecting your flight not the aeroplane they have flying in to service your flight. Always take a careful note of who said what when from the airline about any reason stated for delay. It’s amazing how many reports I see on here where an excuse given at the time by the airline looked highly like it qualified you for EU261 compensation, and later the same people receive a different explanation (that mysteriously would not qualify for EU261 compensation) when contacting the airline formally later to claim. Inbound flight issues are taken into account. For example a plane not arriving due to bad weather on the inbound leg would still get you compensation as the airline should have made alternative provisions (I fell a little over the top). I know because I’ve received the compensation half a dozen times. OT as no bits: What’s the advice on trying to book long-haul first with a 241 with inflexible dates? Is there ever F availability at -355 ? Is it even worth trying? Yes, there is sometimes F availability -355. We book two F trips with a 2-4-1 voucher every year, but not on the very sought after routes. Also routes that have switched to 787-9 with small F cabin hardly seem to come up at all. We got lucky last year on MEX which used to have a daily 747 (which was the case when we booked -355), then switched to 5 x a week Dreamliner a few months later. We kept the F seats. No, nothing guaranteed at 355 days. More likely to open up nearer the time. Book CW to guarantee the seats and then keep an eye on availability. Book CW at -355 and keep an eye out for F availability. If seats become available you can call up BA and pay the £ 35 fee (and Avios) to change to First. As you would expect, it depends where you want to go to. The last few years I have booked F at t-355 to Seattle, back from Vancouver, to Toronto, Boston return. They often start at 9+ seats in F.
Keep watch at T-355 and see the pattern. Also BA Redemption Finder. I have 200k MR points in a US Amex that I had been saving to use on ANA to a trip to Tokyo. Unfortunately it seems the rewards seats on ANA are increasingly hard to come by, and even a year out can be difficult to find 2 return seats. Does anyone have any experience with the ANA waitlist, or know if there are specific times of the year where there is more availability? Or would I be better using these as a 241 in BA F? kudos to IAG for the Level website/branding – simple but effective. However clicking a big box that says ‘New York from $149’ brings me to a city guide about Paris .. so a few kinks to work out. Might NEED to book a flexible upper class ticket on VS in the coming days in my MBNA card. What would happen if I need to cancel it next month when my vs card closes? ???? O/T as no bits … how can I as an Amex Platinum holder refer a friend to Gold? It only seems to let me refer to another Platinum? I seen this when I referred people from plat. Resolved by getting the referred person to open the referral link in a different browser. There should be an option on the page you get from following the referral link to change from platinum to a different card. It’s at the bottom. If you’ve got any adblock function turned on this might also strip out the other options at the bottom of the referral page they receive.